Entertain clients with a fun and interactive wine tasting. ThirtyFifty's tastings are an informal and fun way to entertain clients, whether to cement an existing relationship or get to know new faces. 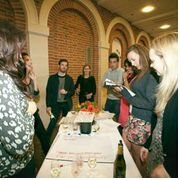 Whatever your objectives, we have a range of tastings and formats to suit the occasion, for large groups or small, and we can tailor the event to your needs. Creating the right atmosphere is key so if you are looking for somewhere to host the tasting we can suggest off-site venues or we can come equipped with all that's needed to host the wine tasting at your offices. During the event leave everything to us so that you are free to relax and engage with your guests. Choose from wine tastings, champagne tastings, craft beer tastings and gin or whisky tastings all hosted by an experienced team with advanced WSET qualifications (Wine & Spirit Education Trust). Our minimum charge is for a group of 10 but we can host events for 100 or more. We taste between 6 to 8 wines, from 1.5 to 2 hours long. Fun and light-hearted intro on how to taste wine like a professional. How to judge quality, blind tastings and quiz rounds. Taste 8 premium quality craft beers, from 1.5 to 2 hours long. Learn how the beer-making process creates the different styles. Blind tastings and quiz rounds. We can also combine beer tasting with wine tasting, with 5 beers and 4 wines to taste. Taste 5 premium quality gins and mix with Fever Tree Tonics, from 1.5 to 2 hours long. Discover the key flavour profiles of gin, mix your own G&T and recreate a classic gin cocktail. Interactive & fun quiz rounds. Any combination of wine, beer and spirits tastings to suit your needs. Our Best of British event showcases wine, beer and spirits from the UK or try a Champagne & Sparkling tasting or Chocolate & Wine. We can provide a champagne reception or still or sparkling wine to greet your guests on arrival. Recommended if guests are coming from different locations and may arrive at different times. So that any non-drinkers feel comfortable and are able to join in, we can bring a selection of non-alcoholic drinks for them to enjoy. Tonics, mocktails and juices at £25 + VAT per person. For an event at the office we can bring along a selection of high quality gourmet cheeses. We can supply prizes of wine accessories or bottles of wine for the winning team and gifts to take away. To find out about booking and request a quote contact us on 0208 288 0314 or email us. I would just like to thank you for a fantastic evening. The event was very professionally run and all our guests were impressed with the quality of the wines and the knowledge on them! I look forward to working with you again in the future. Just wanted to say thank a BIG thank you to Chris and the team for putting on a brilliant event. It was a great success and everybody enjoyed themselves very much. We had a big turn out and we went through all the wine!